Going into hospital is a worrying time for any of us. It can be even harder for someone who has a learning disability. 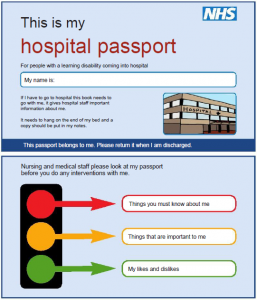 The Hospital Passport is an NHS initiative to help those with learning difficulties and is designed to give hospital staff helpful information that isn’t only about illness and health. 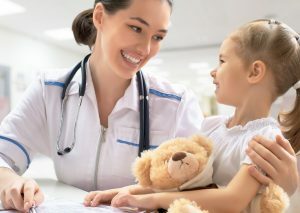 It can sometimes be given a different name, like “personal record” or “my biography”, and may look different from hospital to hospital, but it is the information in it that is key to supporting the individual. It’s about giving individuals who find it difficult to let others know how they like to be supported, what their likes and dislikes are, what help they need/don’t need, and generally have their voice heard, making their time in hospital more comfortable for the individual and their family. What information is included in my Hospital Passport? The passport helps people know how to make you feel comfortable. It doesn’t do away with conversations, but it does go a long way to making sure those conversations are more meaningful and focused. What other names can a Hospital Passport be called? Below are two examples of what a Hospital Passport could look like. It is always best to ask the hospital you are attending if they have their own version. In some cases, specific charities also have their own dedicated Hospital Passports, like the National Autistic Society here. Don’t forget – it is not about what the Hospital Passport looks like, but the information that is in it. How does using Liferaft help me complete my Hospital Passport? When using a Liferaft Premium Account, you only need to add all your critical information once and update it when something changes. This same information can then be used to create different reports, of which the Hospital Passport is one. If you want to try a Liferaft account you can sign up for a no obligation trial. If you are a parent carer, first set up an account for yourself and you will be guided on how to set up and manage an account for your child.